"Let me control the textbooks and I will control the state. The state will take youth and give to youth its own education and its own upbringing. Your child belongs to us already … what are you?" Oftentimes when we see the headlines regarding Obama's ever-growing list of abuses against the American people, we seem to be under the delusion that this is something that only happened in foreign countries in the 1920s, '30s, and '40s. When we look back at the atrocities committed by Hitler, Mao Zedong, Stalin and Mussolini, we say, "That will never happen here." We turn a blind eye and choose not to see the parallel between then and what is happening here through the "foreign to America's Constitution" leader in the White House the American people tolerate. For example, Mao, without regard to the laws, went to the young to have them uproot the capitalists, his "political opponents." Hitler said, "Give me the youth, and Germany will rule the world." Hitler took control of the education system to indoctrinate the youth with his Nazi propaganda. He also established "Hitler Youth," mainly comprised of church youth groups. As if Obama's "Youth Brigade" wasn't bad enough in his first election season, a pro-Obama ad song was released by advertising agency Goodby, Silverstein & Partners titled, "Future Children Project, Re-electing President Obama." Through the song's lyrics, they are using children to promote Obama's un-American, un-constitutional agenda items such as global warming, homosexuality, animal rights, welfare, green energy, government control of education and a disdain for parents. Obama has not hidden his socialist, communist, totalitarian views. He has been outspoken in his ideology that the government should take over every aspect of every American citizens' lives from the cradle to the grave – especially through the infiltration of education. "Education should aim at destroying free will so that after pupils are thus schooled they will be incapable throughout the rest of their lives of thinking or acting otherwise than as their school masters would have wished. … The social psychologist of the future will have a number of classes of school children on whom they will try different methods of producing an unshakable conviction that snow is black. When the technique has been perfected, every government that has been in charge of education for more than one generation will be able to control its subjects securely without the need of armies or policemen." Yes, America, Obama's criminal administration is alarmingly living out the dangerous doctrines of past dictators who destroyed millions of their own people. The sad part of all this is that in America, 86 percent of those who send their children to public schools are professed Christians, conservatives and patriots. Hitler could have been stopped in the 1920s with relative ease, but the German people thought he just was an average run of the mill wacko who posed no threat. History teaches otherwise, and we would do well to heed history's warnings. My documentary series, "My War," has equipped parents, teachers and students alike with the knowledge to combat what is taking place in the public schools. Bradlee Dean's "My War" DVD series is available at the Sons of Liberty store today! 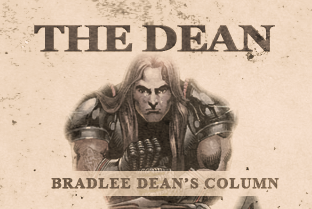 WND's Joseph Farah says: "If you want to see what's wrong and right with our country, watch Bradlee Dean's 'My War' DVD series. It's full of surprises."